Hazel Parade and a giveaway! Yesterday Rochelle and I were literally "fighting" via email and text over who got to post Qui's dress, we both just love it so much! Speaking of Rochelle, Queen of Alterations, she made some changes to the dress that I never would have thought of. She used three different color fabrics for an ombre effect, pleats instead of gathers for the skirt, and top stitching on the seams. The end product is beautiful and perfect for summer. Katiesews2much has made a couple of Hazels (love them both), but I decided to post this one because I love her fabric choice and her styling. Those shoes are adorable! In her blog post she mentioned that she has worn the dress three times. I'm in the same boat, I've worn my Hazels at least once a week! More dresses are featured on Rochelle and Sarah's blogs! 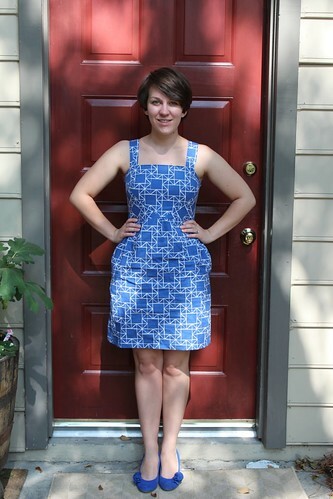 Alright, let's talk business: are you going to be sewing the Macaron dress with us in August? 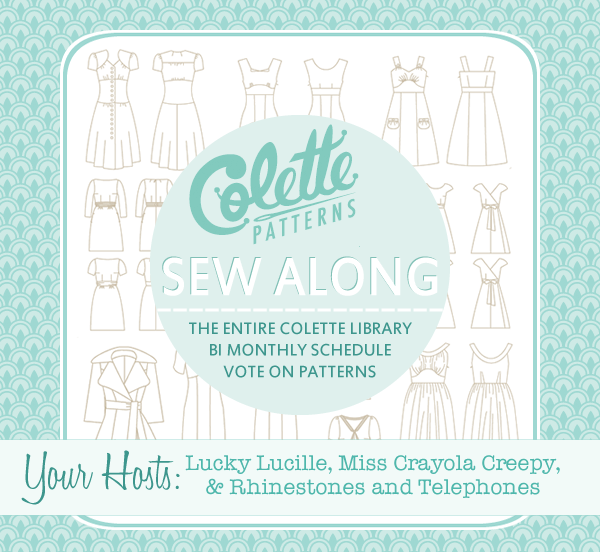 Did you sew Hazel with us or any of the other patterns in the Sew Colette sew-along (Meringue, Pastille, Truffle, Taffy, Licorice)? If you said "yes" to either question then you are eligible for this world wide giveaway! There were a couple of ladies that liked the flamingo fabric I used for my muslin, so I stopped by Quiltin Cousins and picked up a yard to give to one of you! If you would like to enter to win, please leave me a comment and tell me if you have any exciting summer plans coming up. The winner will be announced on Monday, July 30th. Yay! I love your list of favourites! I am glad you picked Rochelle as I was going to pick her, too. 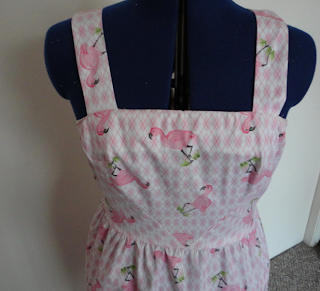 I love, love the flamingo fabric! GAh! I'm in on the Macaron. Love the flamingo fabric. My upcoming summer plans consist of sewing and wearing the Macaron. Hopefully wearing it in Florida! Oh jeez, thank you! :) You just made my Monday! I'm still on the fence about doing the Macaron, but I definetly have tons of plans for the summer. More than I can handle, really. I'm making another Hazel and at some point soon I'd like to try to sew my first knit dress. Oh wow, I love the flamingo fabric! Thanks for the giveaway! I'm having the hardest time deciding what fabric to use for my Macaron! I have signed up for the Macaron and have some ideas bubbling about my head!! I think our summer will start late next month (normally long and hot), I can't wait!! Great Hazel Parade choices. Love love love. I'm definitely in for Macaron, and hope I can do justice to the fabrics I've chosen for it. As for summer, I'm going to the Newport Jazz Festival in a few weeks, and am psyched about that. Any excuse to go to Rhode Island is a good one. 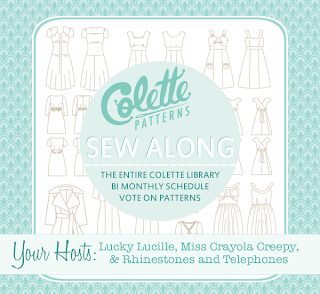 Thanks again for co-hosting all of this Colette gorgeousness!! We're planning a beach trip at the end of August -- so looking forward to it! All my summer plans are finished! Now I'm just waiting for fall! I hope to visit my parents in WA and spend lots of hours in the saddle! :) No real sewing plans at the moment--I think I need a little break. Lots of ideas, and I still have the Colette blouse to tackle, but I'm short on time. Well I am loved that material - I am joining the Macaron Sewalong - my first ever and my other plan is to make some Iris shorts to wear to the Olympics here in London. Man am I bummed that I missed out on this one (my own fault). I don't have any big summer plans at this point. We kinda fled the city (Philly) early this year because it was hot! hot! hot!